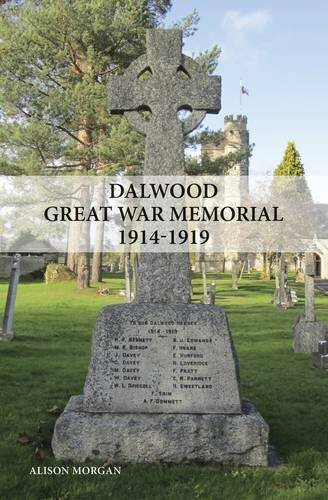 This slim volume covers the First World war contribution of the village of Dalwood in Devon. The primary focus is on the 16 local men who lost their lives and are commemorated on the local war memorial. The book draws on the ‘usual suspects’ of sources (Commonwealth War Graves Commission, Soldiers Died in the Great War, service records, and medal index cards) as well as local sources such as school registers and the local newspaper. Pictures of many of the men are used to illustrate their biographies, accompanied by photos of the war memorial, other memorials in the locality, and some of the places that are referred to. The book could have benefited from further research examining the circumstances in which each man lost his life, for example by utilising battalion war diaries. The second part of the book looks at those who served in the war and returned home. Again brief biographies are provided where details have been found; helpfully a list of all those known to have served is also included. The author’s apparent reluctance to use commas is frustrating and does make some sentences long and difficult to read, but otherwise the book is a nice tribute to all those from Dalwood who served during the war.